1918: The Ottawa Senators and Montreal Canadiens play the first neutral site game in NHL history. Frank Nighbor scores twice in the first period to help the Senators to a 3-1 win against the Canadiens in Quebec City. 1977: Stan Mikita becomes the eighth player in NHL history to score 500 goals. Mikita joins the 500-goal club when he lifts a backhand shot over Cesare Maniago with 6:04 remaining in the third period of the Chicago Blackhawks’ 4-3 loss to the Vancouver Canucks at Chicago Stadium. 1980: Bobby Hull is traded from the Winnipeg Jets to the Hartford Whalers for future considerations. Hull has seven points (two goals, five assists) in nine games for the Whalers. He retires at the end of the 1979-80 season with 1,170 points (610 goals, 560 assists) in 1,063 NHL games. 1982: Denis Savard joins Hull as the only players in Blackhawks history to get 100 points in a season. Savard earns point No. 100 with an assist in a 5-3 win at Los Angeles. He finishes the season with 119 points, surpassing Hull’s Blackhawks record of 107 set in 1968-69. 1989: Guy Lafleur, already a member of the Hockey Hall of Fame before returning to the NHL with the New York Rangers, scores three goals in a 6-4 victory against the Kings at Madison Square Garden. It’s the 17th and final NHL hat trick for Lafleur, his only one with the Rangers, and comes 10 years to the day that he reaches 100 points for the fifth consecutive season with two assists in Montreal’s 7-3 road loss to the New York Islanders. 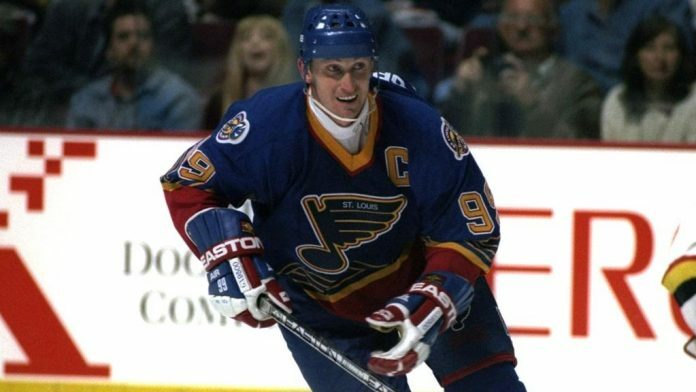 1996: Wayne Gretzky is traded to the St. Louis Blues by the Los Angeles Kings for Craig Johnson, Patrice Tardif, Roman Vopat, the Blues’ first-round pick in the 1997 NHL Draft (Matt Zultek) and a fifth-round pick in the 1996 draft (Peter Hogan). Unlike the Aug. 9, 1988 trade that sends Gretzky from the Edmonton Oilers to the Kings, this works out for neither team. The Blues go 6-10-5 with Gretzky and are eliminated in the second round of the Stanley Cup Playoffs. None of the players acquired by the Kings make an impact in the League. 2002: Mario Lemieux gets two assists in the Pittsburgh Penguins‘ 5-4 home loss to the Kings to become the seventh player in NHL history to score 1,600 points. Lemieux assists on goals by Janne Laukkanen in the first and third periods. 2003: Brett Hull scores twice and has an assist to surpass 1,300 NHL points in the Red Wings’ 7-2 win against the Toronto Maple Leafs at Joe Louis Arena. Hull reaches the 25-goal mark for the 15th time in his NHL career.